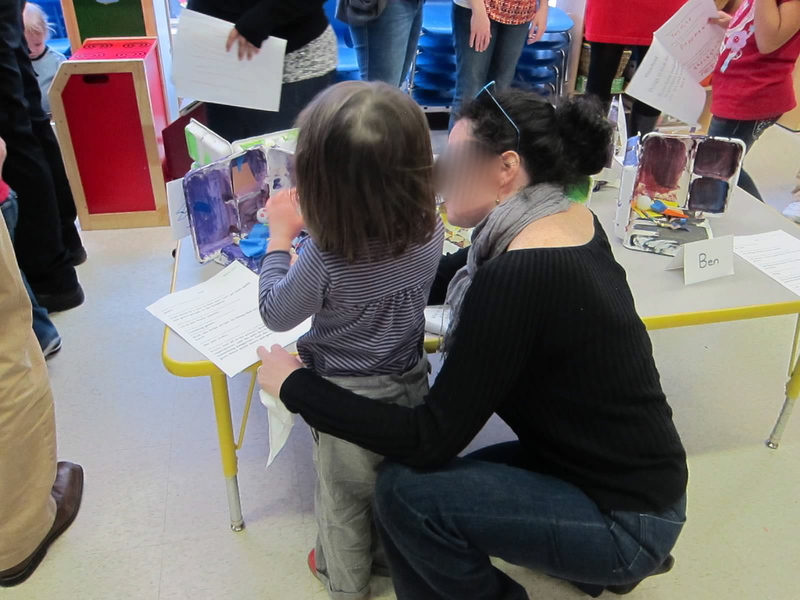 The Reggio-Emila Approach views families as partners in a students’ education. I, too have always held the belief that families are students’ number one support network and play an integral role in students’ educational journeys. Bearing this in mind, I work to forge strong relationships with each and every family in my classroom. I send personal cards home to share about a sweet moment that a student shared with a friend or a triumph he/she experienced in the classroom. I also write a weekly summary of the activities our class does together and the conversations we have surrounding those activities. These summaries are sent out each friday afternoon to all of the families in the classroom, along with announcements and requests for volunteers for parent involvement in the classroom. The above is a sample of a recent weekly newsletter in my classroom. I have included it because it demonstrates manifold ways in which I reach out to and connect to families. The document itself allows parents to take an active role in learning by helping them to stay informed on what goes on in the classroom so that they can talk with their children about their learning. It aims to promote family involvement in the classroom by showing gratitude for parent involvement that has already happened and by encouraging further volunteerism and help. In addition to my reaching out to families, I welcome families into the classroom. I make myself available to families via email around the clock. I welcome the opportunity to conference with families, both at designated conference times and on an as-needed basis as issues arrive through the year. I encourage parents to join us on field trips and welcome them to volunteer in the classroom throughout the year. During mornings, families are welcome to take a few minutes helping their child get settled before saying goodbye and starting the day. Finally, I welcome families into the classroom to share about their cultural traditions. Our family from Norway taught us about Norwegian Christmas traditions around the Holidays. During our school’s focus on diversity and inclusion, I had a number of parents who speak another language at home come and teach us songs and greetings in their language. Our class can say hello in Nepalese, Norwegian, Swahili, Syrian Arabic, and more! The above demonstrates the ways in which I attempt to learn and celebrate the cultural diversity in my room and to incorporate it into my students’ learning. Our class is composed of a rich collection of cultures and languages and part of building our community means weaving these different assets into the fabric of our classroom community. A parent joins our classroom to teach us about a special holiday. A student shares her work with a parent at The Learning Showcase, which is a quarterly student work presentation event at Inspired Teaching School. 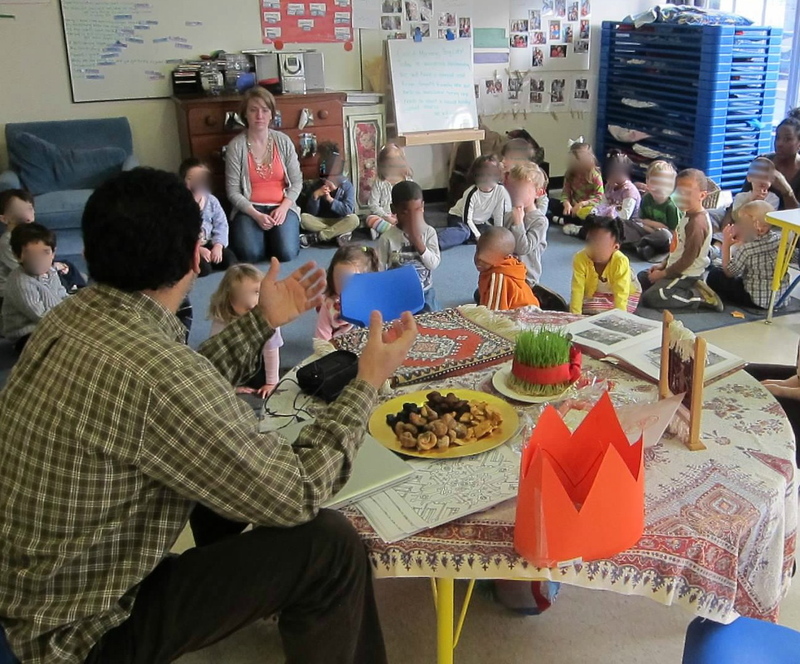 In the Spring of 2014, I started a Mystery Reader Tradition. Parents get the opportunity to sign up themselves, grandparents, older in-school siblings, aunts, uncles, and family friends to be Mystery Readers. Three afternoons a week, we end rest time early and anxiously await the arrival of the Mystery Reader of the day. This turns into children getting a pleasant surprise of unexpected facetime with a family member during school. It also allows parents and other family members to take an active part in the students’ literacy development. And, it’s so much fun! It is always special to cozy up and listen to a story read by a friend’s loved one.